Andy Corrigan was Hollington United's man of the match in the 4-0 win away to Rotherfield. Hollington United Football Club’s first team consolidated top spot with its sixth win in seven games. Two goals in either half gave the Lions a 4-0 victory away to Rotherfield in the Mid Sussex League Premier Division on Saturday. Hollington were the better team in the first 20 minutes and were unlucky not to go ahead when Dom Clarke headed just wide. Jay Tomlin then seemed to be brought down as he rounded the goalkeeper, but the referee judged that he won the ball. 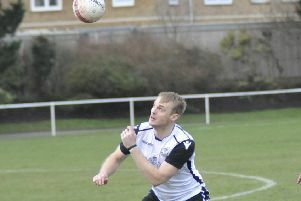 The Lions did go in front when Andy Corrigan spotted the goalkeeper off his line and chipped him from fully 30 yards. A cynic would say it was a cross! Not long afterwards Allan McMinigal, making his debut, made it 2-0 with a superb free kick which flew into the top corner. The second half was a more even affair and the Lions had Shaun Hankinson to thank for a couple of decent saves to keep them two-up. With 10 minutes to go, Clarke wrapped the game up with a bullet header to keep up his good form in front of goal. Three became four with arguably the goal of the game, if not the season, from crowd favourite Ricky Martin. At the end of a move containing at least 15 passes, with Dan Hull and Dan Kearley to the fore, Jan Bailey’s ‘Bergkamp-esque’ touch found Martin, who fired home from the edge of the box. The 1066 Logos man of the match was the impressive Corrigan. Hollington manager Scott Price said: “Very pleased with the result, especially as we had six players missing who usually start. But again I put my faith in the youngsters and they repaid me with another excellent performance as this was their hardest test yet physically.